If you need to eat gluten free, you don’t often get to eat cupcakes. These carrot cupcakes remedy that one. Those who don’t need gluten-free recipes will still love these delightful little carrot and coconut cupcakes, just because they taste good. This recipe needs a 12-cup muffin tin, with cups lined with paper or foil liners. In a medium bowl, whisk together coconut sugar, psyllium, coconut milk, coconut oil, vanilla and vinegar. Let stand for 5 minutes to thicken. In a large bowl, whisk together chickpea flour, coconut flour, potato starch, baking soda, baking powder, cinnamon, ginger and salt. Add the coconut milk mixture to the flour mixture and stir until just blended. Stir in carrots and currants. Bake in preheated oven at 350°F for 25 to 30 minutes or until a toothpick inserted in the center of a cupcake comes out clean, with a few crumbs clinging to it (centers may sink slightly). Let cool completely in the pan placed on a wire rack. Frost cupcakes with Whipped Lemon Coconut Cream (see the recipe below). Start to whip the coconut cream. Near the end of whipping it, when it is almost ready, add the coconut sugar, lemon zest and freshly squeezed lemon juice the coconut cream. An equal amount of parsnips can be used in place of the carrots. Other dried fruits can be used in place of the currants, or you can omit them altogether. Of course, gluten free baking is a bit different than regular baking, but the results are really worth it. 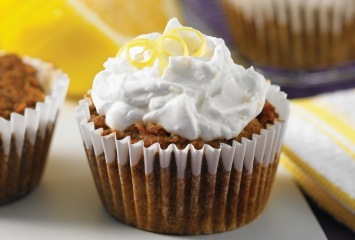 Even if you don’t need to eat gluten-free, you will probably love these healthy cupcakes. This wonderful gluten free cupcake recipe comes from a new gluten free, grain free, nut free vegan cookbook called The Complete Coconut Cookbook: 200 Gluten-free, Grain-free and Nut-free Vegan Recipes Using Coconut Flour, Oil, Sugar and More . Sounds good. Let’s eat healthy cupcakes.